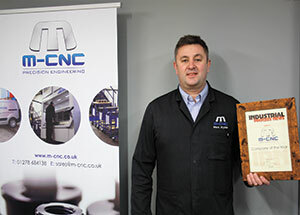 Within this issue of Industrial Process News, we are proud to be awarding M-CNC as our Precision Engineering Company of the Year. M-CNC maintain an experienced reliable team, able to deliver sub-contracted manufacturing of high end precision components across the whole UK. In regards to the companies array of excellent services, M-CNC demonstrate a strong commitment to customer service with emphasis on catering bespoke consultancy advice and impartial advice on in-house resources. The company displays a reliable service for their customers, and showcases the ability to construct a project based of the budget and specific requirements of the customer. M-CNC is also able to perform a full assessment of project lead time and produce a step-by-step solution for on-site and off-site tasks. The company’s clear devotion to customer service is prominent within their policies. Wanting to assure the customer every step of the way M-CNC also maintains a confidentiality guarantee for their clients, with agreements put in place before projects begin. Through their constant investment within the company, M-CNC has developed significantly through their resources. This continuous updated technology has enabled the company to provide the best solutions for customers. “M-CNC take great pride in its ability to offer the best products possible, with all of our components undergoing a robust manufacturing, assembly and testing process. We work closely with clients to create the custom pieces they need using their drawings or 3D models, and all of our products are made to the AS9100 Rev D quality system, guaranteeing quality, durability and accuracy in manufacturing.” Leigh Howarth, Business Development Manager. M-CNC combine their high quality manufacturing capabilities and skills to offer a diverse range of services from simultaneous 5-axis machining to lights out automated production and much more. The specifications of their machines also enable M-CNC to provide cost-effective pricing. Notably, their 3D software from Solidworks & Vero has been a great tool for the company, allowing M-CNC to design fixtures for customers’ products. A highlight for the company expert machinery facilities is their ability to keep on track of their client’s projects through using innovative Manufacturing Resource and Planning programme, which enables them to track all the key dates of the project and monitor costs in real time. 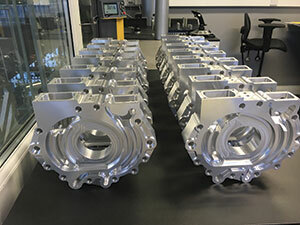 Another remarkable advancement in precision engineering for the company is their CAM system from hyperMILL, this innovative system enables coverage of a wide variety of machining strategies, Including turning and milling with 2D, 3D and HSC applications. M-CNC recognise the value of their team of workers and take pride in nurturing and developing their staff through training and apprenticeships schemes. The company also showcase on-site support and a basic program and operator training service for new or existing employees. Another great resource that M-CNC delivers is at Bridgewater Taunton College, offering apprenticeships to bring new young starters into the industry. So much so, that M-CNC was awarded Bridgwater & Taunton College’s “Small Employer of the year 2018” for our engagement with students. In terms of the company’s unparalleled success this year, M-CNC has reached a pivotal point in growth and demand of their services. In fact, the company received a double turnover in 2018 in comparison to that of 2017. With such a successful 2018 behind them, the companies’ response to demand seems limitless and the possibilities endless for 2019. In addition, M-CNC exceeded all expectations in 2018. Furthermore the company saw a major achievement in 2018; with planned revenue of £1m the company actually achieved a phenomenal £3m! Their growing demand has also enabled the company to expand their workforce in January 2019. In regards to the future development for M-CNC, the company plans to expand further, and provide for a vaster range of clients seeking manufacturing services. In addition, the company aspires to engage fully in the expansion of their brand. Through their very successful year, M-CNC is devoted to maintain and expand upon their established success through new technologies, investment in staff and devotion to their brand. If you would like to take advantage of M-CNC outstanding manufacturing services, then don’t hesitate to get in contact today. Alternatively, you can always find out more information by checking check out their website detailed below. This entry was posted in Company of the Year, Featured and tagged Precision Engineering. Bookmark the permalink.